Whether you are a mobile trainer who visits clients’ barns a few times a week or you operate a full-scale lesson barn with hundreds of horses on site, you face substantial personal and business risks. What happens if a client’s horse is seriously injured or if your training efforts don’t meet your client’s expectations? What happens when a rider falls off during a lesson? The tips below offer some suggestions to help prepare for these contingencies. Unless you put your entire training or lesson agreement in writing and have each of your clients sign it, it will be very difficult to prove what your agreement was if you have a dispute (and sooner or later, you WILL have disputes!). Your training or lesson contract can also help avoid misunderstandings and late payments by clarifying, among other things, what services will be performed during the training or lesson period and by whom, what happens if the horse or rider is injured during the training or lesson period, what the fees are, when payments are considered late, what happens if clients don’t pay and under what circumstances you will terminate a training or lesson relationship. It should also include a liability release and specify that although you are training the horse, you can offer no guarantees regarding the horse’s behavior. Even if you have just a few training or lesson clients, having a contract in place is an excellent investment for your peace of mind. Equine Legal Solutions offers trainers and instructors contract packages at fixed, affordable prices. As most horse people know, it is impossible to run a training or lesson facility that is entirely accident-free. Sooner or later, despite your best efforts, something unfortunate WILL happen, and for those occasions, you should have insurance for your business. Read your policy and become familiar with its terms and conditions, or Contact Us to review your policy for you and explain its limitations. Make sure that your policy is intended to cover liability for injuries to people, livestock and property, for both your business and your clients, and make sure that your deductible is high enough to keep your rates relatively low, but not so high that it would be a hardship for you to pay. See our equine insurance buying guide. As part of your training contract, you should ask for a deposit and if you are teaching lessons, you should ask for payment on the day of the lesson. If you will be keeping the client’s horse on your property, the deposit amount should be sufficient to cover your costs for feed, etc. If the client refuses to pay a deposit, you may wish to reconsider whether the business relationship will be profitable for you. After all, if you were training horses for fun, you’d be training your own horses, not someone else’s! As a general rule, business owners are liable for their employees’ negligence, and therefore failure to train your employees can result in big problems for you as a trainer or instructor. For example, each one of your employees should be instructed in proper horse care and should be able to tell if a horse is ill or injured. They should also be required to attend and pass basic first aid classes, with periodic continuing education on these subjects. If your employees will be performing some of the training tasks and/or teaching lessons, you should ensure that they have received proper instruction from you. Equine Legal Solutions can help you develop a training program for your employees. Your training and lesson program should include written safety procedures for what to do when, e.g., someone is thrown from a horse or a horse is found ill or injured. You should train your employees and clients regarding those procedures and check in periodically to make sure that the procedures are being followed. When incidents occur, your procedures should include creating a written record of what happened, including what your employees and/or clients did to respond. Instead of relying upon your clients and employees to use common sense (we all know how “common” that is! ), have a comprehensive set of rules designed for the safety of your clients, employees and horses and post those rules prominently. Each client and employee should be required to sign a statement that they have read and understood the rules and that they agree to follow them. Your employees should also be trained how to enforce those rules and you should not hesitate to terminate employees or clients who routinely violate important safety rules. 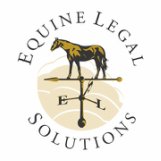 Equine Legal Solutions can help you develop a safety program designed to protect your clients, the horses and your employees. Far too many trainers and instructors make the mistake of not separating their personal assets from their business assets. It may be a minor hassle to create a separate entity for your business, but when you are operating a relatively high-risk business such as a training stable or lesson barn, your potential liability is far too high NOT to take this step. For example, if a client is thrown from a horse that you trained and dies from a head injury, their family could sue you for millions of dollars for wrongful death. Equine Legal Solutions can help you incorporate your business and take other important steps to protect your personal assets from your business liability.